Injectors and Injector Life We specialize in Rebuilding and Overhauling VW, Mercedes, and other Bosch injection components. A common question we get is: “How do I know if I need new injectors?” read on and we will explain a couple ways to check also we have very good news, most injectors are rebuildable without requiring replacement with “New Injectors” saving you upwards of over a $1,000.00 or more. A little background on injectors, Injectors are comprised of two components, the “Nozzle Holder” and the “Nozzle”. 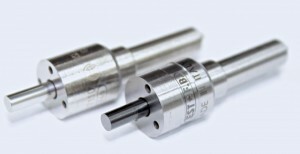 The Nozzle Holder is for the most part rebuildable multiple times and generally lasts the life of the motor and beyond. The Nozzle, like a spark plug in a gasoline engine is a consumable part and is by design intended to wear out and be replaced with time and usage. How many owners of a gasoline engine would consider running a set of non-Platinum core spark plugs more than 40,000 miles much less 100,000, 150,000 or even 200,000 miles or more without replacement? The nozzles that originally came in your engine were never designed to run much past 150,000 miles by virtue of wear factors and emissions requirements. Wide variations in lubricity with ULSD fuels poor target lubricity (520 HFFR vs the systems design requirement of 400 HFFR) makes the use of those older nozzle designs (most dating back to the early 1990’s) obsolete and generally will not last the original target of 150,000 miles. However and thanks to modern materials available in 2013, DLC coatings and tighter production tolerances make it possible to offer nozzles that provide 3-5 times the original life target and only require an occasional cleaning or adjustment to insure proper running. 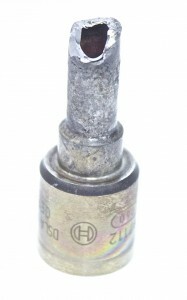 Well, the question remains How do you know if your injectors nozzles are in need of replacement? There are generally obvious signs such as reduced fuel economy, smoke on start-up, increased visible smoke when driving at normal speeds. More obvious signs are black smoke during hard acceleration indicating late injection and poor atomization of the fuel and this always leads to very expensive fuel being wasted out your tailpipe. 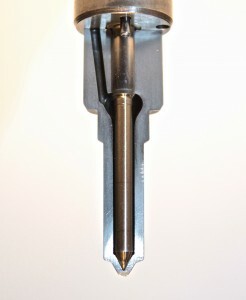 In most injectors, the low pressure opening is used as an indicator of wear. Also, leakage from the injector return fitting (at the top of the injector) is a direct indication of leakage from the injector and a measure of total wear inside the injector. It should be noted that “some” leakage is required, however leakage rates of several ounces per minute at idle are an indicator of severe internal wear. This leakage works against you on two counts, first this is fuel that is not making it to the cylinder, secondly this is causing your injection pump to over-supply injectors with fuel that is not being used to power your vehicle. This added supply is unnecessary pumping stress on your injection pump and can lead to increased wear and load on your motor further eroding your engines efficiency. In most “Direct Injected Motors” or in the case of the VW TDI there is a well documented life cycle. When new the new specification for an injector is to sequence at 220 bar. As the nozzle wears out that opening pressure drops and is a direct indication of the nozzles internal wear. This is also an indication of internal leakage which also causes a further decrease in this opening pressure. 220,000 miles of use, Diesel Fuel only, stock engine, opening pressure found to be at 190 bar and indicated 30% beyond it’s intended service life. 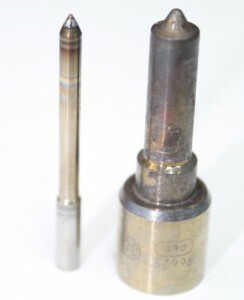 Injector Nozzle replacement and/or Pressure Calibration We perform Injector nozzle replacements and rebuild your injectors back to new specifications and tolerances. 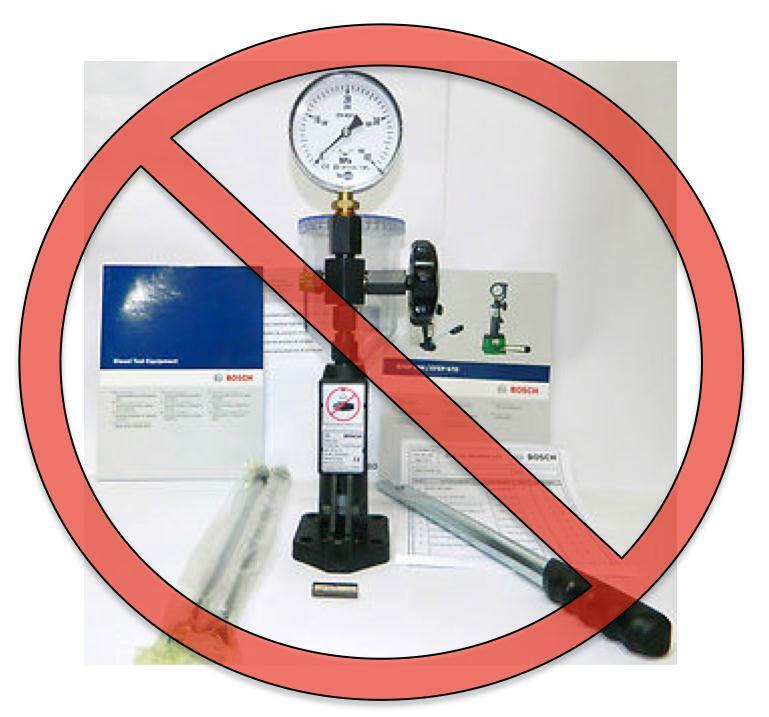 Unlike other shops that claim to be able to set “Break Pressure” we have the equipment to precisely set both Pilot and Primary break pressures in two stage injectors using a state of the art digital pressure test bench as well as set flow ranges simply not possible in your average injector shop. All of this insures perfect and precise balance and sequencing of injection to each cylinder. We start by completely disassembling and ultrasonic cleaning all internal components including the nozzles and needles (if not being replaced with our latest generation of DLC ULSD Rated Nozzles ). Ultrasonic cleaning insures all parts are completely stripped of varnish and gums which normally occur in all fuel systems and lead to degraded injector performance and flow imbalance. Injectors are then resurfaced as needed then reassembled. All stages of pressures are reset to new tolerances typically with less than 1 bar maximum variance. 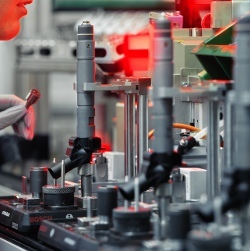 After all pressures, flow settings and spray patterns are set and evaluated the injectors are coated with a high temperature coating that protects the injectors from corrosion and improves the aesthetic value of your newly conditioned injectors. High Pressures Require High Precision Hardened Steel Shims We only use the highest quality precision lapped hardened steel shims from Germany. These are the same shims used to set the pressures when your injectors were first produced at the factory. We stock the complete range fine tolerance shims and adjustment pins which permits us to accurately set any pressure desired with a level or precision simply not possible at any other injection repair shop. Unfortunately we have found failed attempts at working on injectors often these attempts results in the use of shims made from much softer stainless steel typically used by other shops when they have attempted to set the break pressures only. Often the well intentioned shops revert to “stacking” of multiple thinner shims on top of the original shim to achieve the desired thickness. Use of stainless steel shims results in flattening and eventual disintegration of the shim within the injector. The failure of the shim is due to the extreme pressures generated by the rapid cycling of the nozzles and their internal mechanisms. 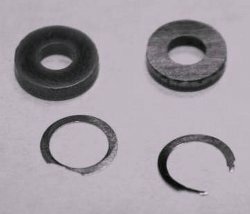 The resulting loss of shim thickness and failure of the stainless shims leads to the injector falling from the set opening break pressures resulting in poor fuel quantity control and increased smoke output. Aside from pressures, the failing shims generate metal fragments that are free to circulate within the precision workings of your injectors and expensive high pressure fuel system. Uncompromising quality and precision, Our promise to you We treat every component as if it is going in our own personnel vehicle. We take ownership of your components and insure the absolute highest level of precision and workmanship that goes into them. If we can’t promise to do it right, we won’t do it at all.